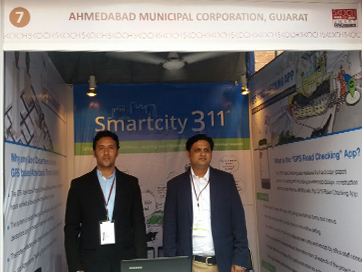 We also had our booth at 41st Skoch Summit – Transformative Governance event for two days (22nd and 23rd September 2015) to represent our application SmartCity-311 among visitors. The Summit is attended by huge national and international media as well as television channels. There were 68 participants in the Skoch Exhibition on Smart Governance Practices and the event was sponsored by Yes Bank, Microsoft, MasterCard, HP, AMD, BSE, ABM Knowledgeware Ltd., And Suvidhaa. Our company got a positive response from the visitors while representing our solution SmartCity-311.